SoftPlanet makes it possible for everyone to get free Music Download Center download directly from our servers. There is no registration needed for downloading. 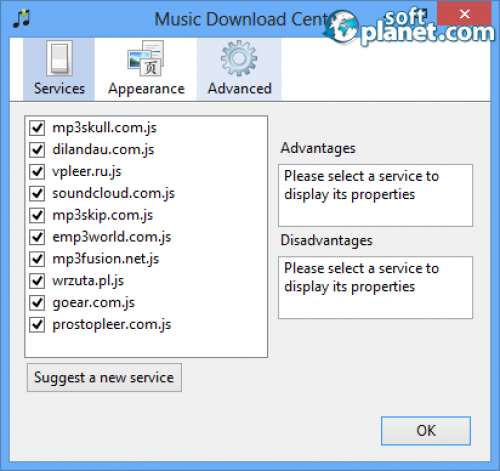 Music Download Center v0.7 is free software for Windows, Mac and Linux and helps the users to download music files the easy way. It does not require a registration or anything else. We have to mention here that this app works only with non-copyright protected files. It searches thru many websites and reports a list of the founded tracks. The integrated web radio is one of the features. It offers thousands of possibilities and they can be sorted by the genre you want to listen to. The space required on the hard drive is 43 MB (that's after download and install). Users can share their music on Facebook, Twitter and MySpace as well. Different languages are supported. The default search websites for search are mp3skull, mp3skip, mp3fusion etc. Music Download Center has a simple and an easy to use and navigate interface. Three menus in the top right corner provide all the functions needed. On the left the search window is placed and in the middle the results are displayed. Underneath the menus are the mode tabs: Search, Radio, Internet, History and Downloads. A Share button is located down on the right. To search for desired songs users have to type in the artist, title or both inside the search box. The results are displayed within seconds in the middle. Each one of the listed files can be listened to for quality issues before downloading. Hitting the Radio tab brings the list of the all available web radios which can be sorted by genre and bookmarked if you click on the star. Music Download Center can quickly fill up your music collection. With excellent download speed files are ready to be listened to, shared and edited in seconds. So sit down and relax while listening to your favorite songs played directly from your device. Music Download Center is VIRUS-FREE! Our security scan shows that Music Download Center is clean from viruses. The current version of Music Download Center has been scanned by our system, which contains 46 different anti-virus algorithms. That ensures that Music Download Center 0.7 is 100% safe for your computer.